Just for fun late Saturday night I whipped up this here banner based on Scott M. X. Turner’s site logo design and on Sunday for the first time ever marched in the Banner Day parade. I probably would not have done this had I not already had tickets to the game, but the Mets somehow knew that and so barely bothered to promote the tradition; I only heard about the event from reading other blogs. The entire thing was like a rumor. I’m sure the extra labor involved with leading the fans through the stadium’s guts while keeping everything else on schedule — I’m sure it was no easy task — held little appeal for the organization, as did the potential for appearing that they might actually encourage or condone graphic commentary from the peanut gallery. I’m not even sure they let you in with a sign on any other day anymore. The late Karl Ehrhardt , the “Sign Man” our banner honored, is about as subversive as they come in that respect; part of the appeal of his wry commentary was that it held the potential to shame or embarrass the club or its players when they deserved it: It was a unique means of live commentary practiced today by millions of less clever folks on Twitter. 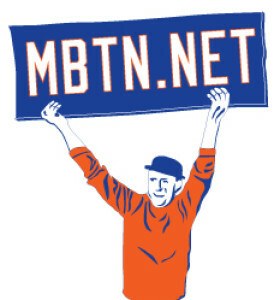 Ehrhardt in a 2006 interview said he felt the organization turned against his schtick upon the changing of team ownership in the 80s: Clearly the Mets still today retain little affection for such Mad Men-era aspects of their organization but I’m glad to have played a small part in keeping it alive. Mets staff by the way were all great. The usher way up near our section 535 seats even let us tape the thing on the railing at gametime. Today we’re awaiting new of what jersey they will slap on newly arriving relief prospect Akeel Morris, who’s making a flying leap to Flushing from Class A St. Lucie so as to provide extra bullpen depth after a taxing weekend. Morris was assigned 64 during Spring Training this year. Morris given his spring training number 64. Lame…. 64 may also be his ERA after tonight. Morris going down, Logan Verrett coming up. I will guess they give him #46. If Verrett gets into a game, he’ll be #998. I guess Matz is next at #999 leaving #1000 for Sandy’s big deadline pickup.